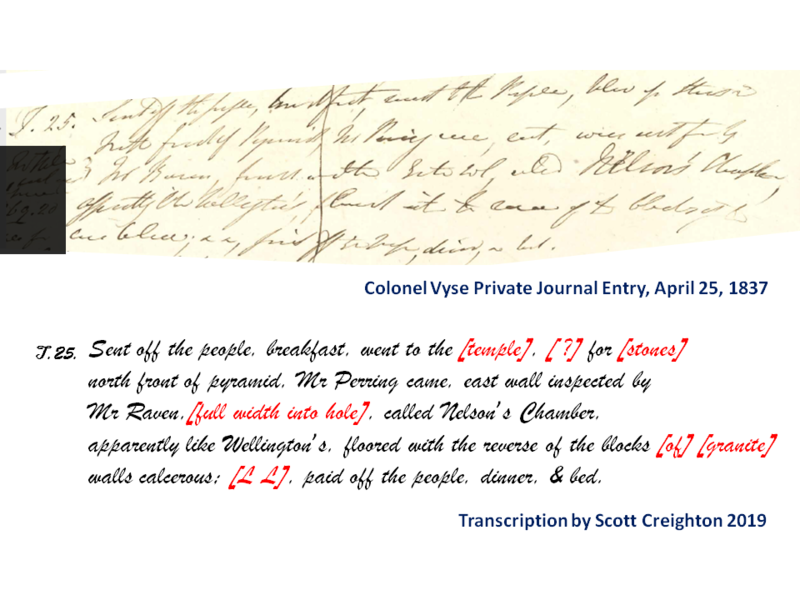 As we can see from Vyse’s private journal (above) wherein he gives us his unedited, uncensored, private thoughts of that day’s key events and activities, having entered Nelson's Chamber for the first time he makes a few observations about the chamber but, oddly, here in his private account he completely fails to make mention of the presence of any quarry marks on the chamber wall as claimed in his published account of this same day. And let us be clear here—had painted quarry marks truly been present on the western wall of this chamber when Vyse first entered it, then we can be absolutely certain that the Colonel would not have been remiss or shy in making a note of such an important discovery in his private writings of that day's key events; this would not have been a discovery that could have easily slipped his mind. That Vyse, in his private account, makes no mention on 25th April of such an important discovery (contrary to his published account) strongly suggests that there were, in fact, no marks present in Nelson's Chamber at that time for him to comment upon in his private notes at the end of that day's activities, hence the complete silence therein. It is only on the 27th April (3 days after the chamber was first opened) that Vyse first mentions quarry marks in Nelson's Chamber in his private account and that is a whole other story which I will be writing about later in a separate article. I am not certain that your transcription is altogether correct. Surely, for instance, what you have read as “walls inspected by Mr Raven” is more plausibly read as “was sent for by Mr Raven.” I notice that at other points in your transcription, you indicate uncertainty, but here, it seems, you have full confidence in your reading. Can you really justify this? If Vyse’s handwriting remains as difficult for you as it seems to be (and looking at this sample, it would not be surprising), is it wise to base arguments on his journal at all? Furthermore, I do not understand why Vyse’s published work would necessarily be a precise reflection of his field notes. For comparison, none of the events mentioned in Reisner's Vol.11.p.021 appear to be found in Mycerinus, his published report. As for Vyse, he seems in writing for publication to have often brought descriptive material forward, giving details (such as dimensions) which were not known on first opening a chamber (say). Had he not done so, the reader would be given next to no word picture of the thing being described. Your entire contention here is that Vyse did not mention the quarry marks (in his personal journal) quite as soon as you say he should have. Surely this is scarcely even a weak argument? Are you not merely scraping the bottom of the barrel here? Nor has anything you have written recently made it any clearer to me what motivation Vyse would have had for forging any of the inscriptions in the chambers. While I do not accept your transcription, you are perfectly entitled to your view. Of course, this small change to the entry of this day in Vyse's journal notwithstanding, the point here is that there is categorically no mention in this day's journal entry of anything remotely about the discovery of any 'characters', 'hieroglyphs', 'figures' or 'quarry marks' on the western wall of this chamber; words in Vyse's handwriting I am very familiar with. There's nothing at all. Vyse remembers to write about mundane events such as having a rest that day, about Mr Perring arriving, having dinner & bed but totally forgets to mention the discovery of a lifetime that day in his private journal? Really? In my view it is simply inconceivable that Vyse, in his private journal entry of that day, remembers to mention several mundane events from that day and yet completely fails to make any mention of a highly important event i.e. the discovery of 'hieroglyphs' within the chamber. I just do not buy for a nanosecond that, had those marks truly been present on the wall of that chamber on that day, that Vyse would have failed to mention it in his private account on this day while remembering to mention other mundane events from that day. It makes no sense. As we can see, the painted characters/inscriptions in these chambers, in Vyse’s stated view, were “...of great importance...” and so much so, in fact, that he had two separate copies of them made (one set by Mr Perring to be used in Vyse’s future book and another by Mr Hill for the British Museum). Later still, on 19th May, the colonel even organised for a group of independent witnesses to attest to the accuracy of Mr Hill’s drawings of the inscriptions he had made from all four of the chambers opened by Vyse. Thus we can be certain that Vyse would have absolutely known and understood the importance of the marks in this chamber and yet, on the day he first entered that chamber, he writes nothing of it afterwards in his private journal. He says absolutely nothing in this day's journal entry of a 16 foot wide wall filled with painted inscriptions—a private journal where Vyse gives us his innermost thoughts, his very own first-hand account of what truly happened that day. And we have to accept that the private journal, being chronologically closer to the events in question, is more likely to be accurate than a much later revised account for publication. Quite simply, the omission of this important event from his private thoughts of that day strongly suggests to me that no painted quarry marks were, in fact, present on the western wall of this chamber on the day this chamber was first opened. You are, of course, perfectly entitled to disagree.